The Navy’s monster jet boats are certainly controversial but one thing is about them is unquestionable: they are pretty damn quick with a sprint speed in excess of 45 knots. 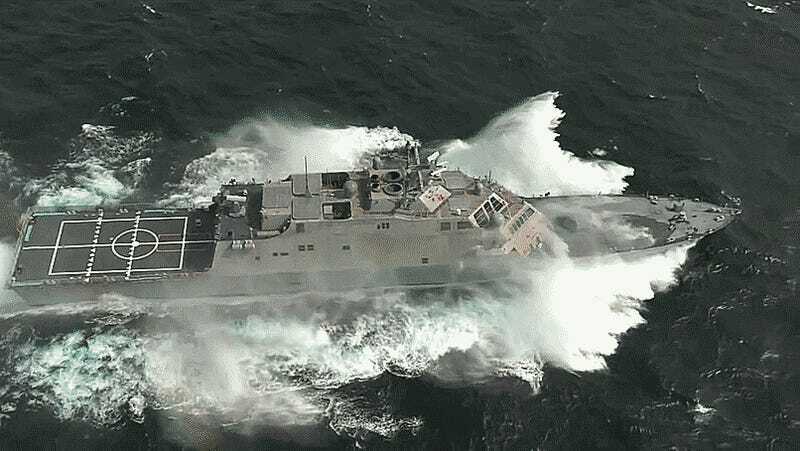 The video below gives you an idea of what the Freedom Class LCS looks like executing such a high-speed run. The USS Milwaukee gets its power from a pair of Rolls Royce MT30 gas turbines engines which share 80 percent commonality with the Trent 800 series high-bypass turbofan jet engines found on many Boeing 777s. Each MT30 is rated roughly at a whopping 48,280 hp. These are tied to a quartet of Rolls Royce water-jets that can propel the LCS at high speeds even in shallow waters.